In celebration of the Kentucky Derby Festival’s Opening Ceremonies, Thunder Over Louisville, Four Roses has released a Limited Edition Single Barrel Bourbon Bottle featuring the iconic Thunder Over Louisville logo. Four Roses is also the Official Bourbon of Thunder Over Louisville. The limited edition bottle, priced at $44.99, is exclusively available now at Cox Smoker’s Outlet and Spirit Shoppe, as well as Cox’s Evergreen Liquors. Thunder fans and bourbon connoisseurs will also have the opportunity to have their bottles signed by Four Roses Master Distiller Brent Elliott and Senior Brand Ambassador and Bourbon legend Al Young. Friday, April 13 – Senior Brand Ambassador and Bourbon Legend Al Young will be signing bottles at Cox’s St. Matthews from 4 – 7 PM. Thunder Over Louisville – the Derby Festival’s Opening Ceremonies – is one of the more than 70 events produced by the Derby Festival in the spring. 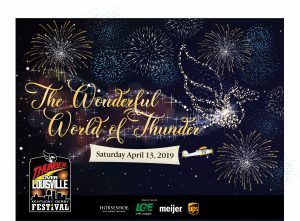 The 2018 Thunder Over Louisville, themed “A Disco Thunder,” is set for Saturday, April 21, and will be the 29th annual production. Through a special second chance promotion sponsored by the Kentucky Lottery, Louisville resident Bob Paxton won the opportunity to be this year’s Festival Fanatic for the 2018 Kentucky Derby Festival. As part of his big win, Paxton will serve as the Thundernator for the Derby Festival Opening Ceremonies: Thunder Over Louisville on Saturday, April 21. At age 62, this will be Paxton’s first ever Thunder experience. He will have the opportunity to provide the Thunder countdown and “zero” ignition to activate the launch system sequence in the Command Center at the Galt House Hotel. Additionally, Bob receives nine other Festival VIP experiences. This includes a ride down Broadway in the Republic Bank Pegasus Parade, a hot air balloon ride, seats on Millionaires Row during Celebrity Day at the Downs, and $500 in spending money! Over 5,000 fans entered the promotion which kicked off on February 5th. Players signed in or registered for a Fun Club Rewards account at www.kylottery.com. Once logged in, they were able to submit an eligible non-winning KENO ticket worth $5 or more for a chance to be named the 2018 Festival Fanatic. Paxton will also be in town on Friday, April 20th. He will visit the Command Center for the first time at 10 a.m. that morning. Media is invited to the Command Center to meet him in person on April 20th. Paxton won a VIP Experience package that includes: an invitation to the Festival’s annual They’re Off! Luncheon on Friday, April 20; a Second Street Bridge and Command Center Tour also on Friday, April 20; Overnight accommodations for a family of 4 at the Galt House Thunder weekend; and a front row seat in the Command Center on Saturday, April 21, to flip the switch. Thunder Over Louisville – the Derby Festival’s Opening Ceremonies – is one of nearly 70 events produced by the Derby Festival in the spring. 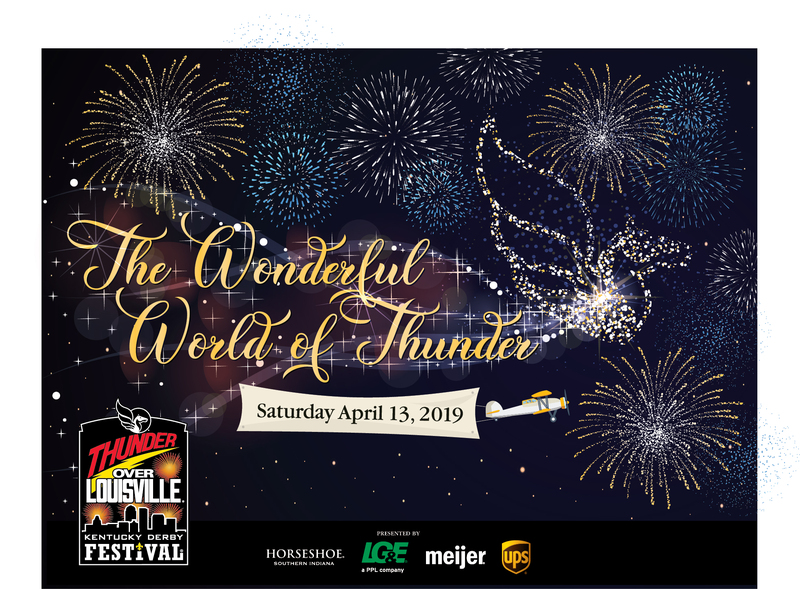 The 2018 Thunder Over Louisville, themed “A Disco Thunder,” is set for Saturday, April 21, and will be the 29th annual production. The show is sponsored by Horseshoe Southern Indiana, LG&E, Meijer, UPS, and Valero. Thunder Over Louisville fans making plans for a place to park their cars or pitch a tent have an option that’s close to the action. Louisville Parks and Recreation is selling passes for Thunder weekend at Eva Bandman Park, 1701 River Road. Eva Bandman Park is located along the Ohio River near Frankfort Avenue, less than a 10-minute stroll from the eastern edge of Waterfront Park. Recreational Vehicles – $200 for Friday and Saturday nights; all parking on the pavement and trailers with up to 40-foot awnings are allowed. Tents – Campers bringing tents may stay in Eva Bandman Park on Friday and Saturday nights for $50. This includes space for one car, not necessarily next to your tent. Additional cars are $15 each for both RV’s & Tents. Parking – On Saturday, April 21, parking spots at Eva Bandman Park will be available as long as space permits, at a cost of $20 per vehicle. Cash only, paid at time of arrival. Overnight visitors in tents and RVs can stay through Sunday morning. Metro Parks’ staff will be available around the clock. A reservation form can be found here. After staging their site on Friday, those not wishing to camp overnight may exit the park using their extra vehicle and return on Saturday. Previous parking spaces are not guaranteed. Spaces may become limited as Saturday progresses; no other re-entry is authorized. Advanced registration is highly recommended as the Louisville Police Department will be organizing street closures in the area. For more information call 502/574-7275 (PARK). Ordering Papa John’s pizza will help support this year’s Thunder Over Louisville, now just one month away. Papa John’s and Kentucky Derby Festival officials announced this morning that Papa John’s is the new title sponsor of the Thunder Funder program. The program2 helps raise funds for Thunder Over Louisville – the Derby Festival’s Opening Ceremonies set for April 21. Beginning today, participating Papa John’s locations will donate $1.00 of every Thunder Fireworks pizza purchased to help support Thunder. The Thunder Fireworks pizza must be ordered online at PapaJohns.com using the online promo code THUNDERPIZZA. Papa John’s is renaming their popular “Works” pizza to the “Thunder Fireworks” pizza for the special promotion, which will last from now through May 6, 2018. The pizza features pepperoni, Canadian bacon, spicy Italian sausage, onions, green peppers, mushrooms and black olives. In 2017, Papa John’s locations across Kentuckiana and Central Kentucky raised and donated a combined $191,000 to local organizations striving to make communities a BETTER place to work and live. Papa John’s FIREWORKS Pizza promotion will help to support one of the iconic annual events in Louisville. Papa John’s partnership with Thunder in 2018 also includes new Papa Wi-Fi Zones with charging pods throughout the venue to help fans stay connected, so they can easily share all their favorite moments from this year’s event with family and friends. The theme of this year’s show is “A Disco Thunder,” celebrating disco music. The Festival is also planning for another packed air show in 2018, which could include additional military aircraft participation. Presenting sponsors of Thunder Over Louisville are Horseshoe Southern Indiana, LG&E, Meijer, UPS and Valero. Ford Motor Company returns as sponsor of Ford’s Thunder on the Ground. Thunder Over Louisville’s 2018 Official Broadcast Partners are WLKY TV and SummitMedia’s 106.9 PLAY. The Galt House is the Official Hotel of the event. Thunder Over Louisville is one of the more than 70 events produced by the Derby Festival in the spring. 2018 marks the 29th annual production. The KFC Yum! 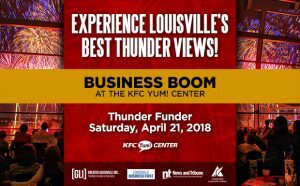 Center is expanding its Thunder festivities with an event created specifically to enable members of the Louisville business community to connect, expand their professional network and discuss opportunities for collaboration. The event will take place in the arena’s Woodford Reserve Lounge, which overlooks the Ohio River and provides premium viewing opportunities for the Thunder Over Louisville fireworks and air shows on Saturday, April 21, 2018. The all-day event is presented by KFC Yum! Center in partnership with Greater Louisville Inc., Louisville Business First and Leadership Louisville. Louisville businessman and philanthropist Dr. Mark Lynn, owner of Visionworks, will speak at the event. Lynn is the current Chairman of the Kentucky State Fair Board, is active on the University of Louisville Foundation and Finance Committee and is a Trustee for Sacred Heart Schools. He and his family believe in giving back through involvement and development of the communities they serve. Additional speakers will be announced at a later date. For more information and to order tickets, please visit kfcyumcenter.com. Tomorrow kicks off the two-week Kentucky Derby Festival with one of the largest fireworks displays in the country. Thunder Over Louisville is a fun family event that features music, food, an air show, and a very large fireworks display at the end of the day. Unfortunately, the weather will not be so cooperative, and there is no rain date. As long as it is safe to be near the river, the show will go on. We are currently looking at a high near 50 degrees with nearly 100% chance of rain. Visitors to the main viewing area on either side of the river will need a Pegasus pin for entrance. The official program for the day will be available tomorrow in the local newspaper. The day begins when many displays open at 11:00 AM. The US Military will have multiple interactive displays on the South Great Lawn, including a dog tag machine, a fitness challenge, an obstacle course, and a 4D virtual reality simulation of a Navy rescue mission. The South Lawn will have activities geared towards children, such as the ninja jump and Meijer will be sponsoring a Family Fun zone that will feature face painting, bounce houses and a beer garden for the parents. The famous air show does not start until 2:30 PM (recent time change from 3:00 PM). The line up of acts will feature aircraft from the US and other foreign countries’ militaries, both past and present. The show usually features a couple of stunt pilots that will display their skills in the cockpit by performing stunning, and dangerous, maneuvers in the air at various heights. 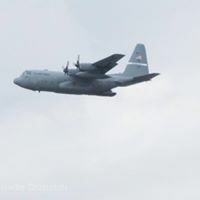 If you have not been to a Thunder Over Louisville event with cloud cover, the ability of the planes to fly close enough to be seen is dependent on the ceiling level and the pilot’s discretion. The entire line up of airshow can be seen online, but it is subject to change. The air show ends when the fireworks start. As with the previous 27 events, the 28-minute fireworks show has a theme. This year it is “Local & Original”. Along with the fireworks, there is a musical score to go along with the show and as always, there will be a salute to the US that usually features the US flag being flown by aircraft in the viewing area and a few well-known, patriotic songs. The fireworks are currently scheduled to start at 9:30 PM. If you plan on attending the event, some useful information can be found at the Kentucky Derby Festival webpage. You should plan on leaving any personal drones, tents, canopies, glass containers, alcoholic beverages, pets, bicycles, and grills at home. Lawn chairs are permitted and so are tarps (as long as they are under 10′ x 10′). Event organizers also recommend that you dress for the weather (possibly consider a change of clothes in a waterproof bag or in the car), make sure you gas tank is full (traffic after the event can be slow moving at best and many routes that may be familiar will be blocked), and plan to park as far away as you can comfortably walk. A map of the viewing area is also available on the website. If you do not want to drive to the event, the local public transit provider, TARC, will have extra buses on certain routes and alternate loading spots following the event. More information, including route changes and detours, can be found on their website. If you are unable to attend the event or do not desire sitting in the rain all-day, you can listen to the show all day on WVEZ 106.9 and many local news stations will air the event as well.